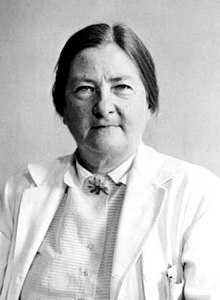 Dorothy Hansine Andersen (May 15, 1901 – March 3, 1963) was an American pathologist and pediatrician who was the first person to identify cystic fibrosis and the first American physician to describe the disease. In 2001 she was inducted into the National Women's Hall of Fame. Once she graduated from Johns Hopkins, Andersen served as a teaching assistant in anatomy at the Rochester School of Medicine. A year later she became an intern for surgery at the Strong Memorial Hospital in Rochester, New York. After completing her internship year, Andersen was denied a residency in general surgery at the hospital because she was a woman. This drove Andersen to focus on her research instead and in 1929, she began working at Columbia University's College of Physician and Surgeons as an assistant in pathology. Later, she was asked to join the faculty as an instructor at Columbia Medical School. In order to further her research career, Andersen began to work on her doctorate degree in medical science by studying endocrinology at Columbia University. Specifically, she studied the influences of the endocrine glands on the onset and rate of sexual maturation in rats. By 1935, she received her doctorate from Columbia University and worked as a pathologist at Babies Hospital at the Columbia Presbyterian Medical Center. This is where Andersen remained for the rest of her medical career. In 1945, Andersen was given the title of an assistant pediatrician at Babies Hospital. Because of her knowledge of anatomy, she was called to become a consultant to the Armed Forces Institute of Pathology during World War II. In 1952, she became the chief of pathology at Babies Hospital. Later that year, Dorothy Hansine Andersen was awarded the Elizabeth Blackwell Award. During her research career, Dorothy Hansine Andersen studied many children who had digestive or breathing problems and also performed autopsies on those who died from these problems. While performing autopsies she noticed many of the patients who had died from celiac disease had fluid-filled cysts that were surrounded by scars on the pancreas. She also found similar scars and tissue damage in the lungs and came to the conclusion that the lung and pancreas damage came from the same disease which she called "cystic fibrosis of the pancreas." The name cystic describes to the cysts found the fibrosis describes the scar tissue in the lungs and pancreas. This was published in the American Journal of Diseases of Children in 1938. She was awarded the E. Mead Johnson Award for her recognition on this disease. In 1942, Andersen developed the first efficient diagnostic test for cystic fibrosis with Paul di Sant'Agnese (who also worked at Columbia University) at Babies Hospital. In 1948, The American Academy of Pediatrics awarded Andersen the Borden Bronze Plaque for her successful research in nutrition, “Determining the effectiveness of different antibiotics in relieving the respiratory-tract infections that were the main cause of death from cystic fibrosis.” By 1958, Anderson was a full-time professor at the Columbia College of Physicians and Surgeons. During this time in her career, Andersen wrote in the Journal of Chronic Diseases that her research findings corresponded to cystic fibrosis is a recessively inherited disease that was once thought to be fatal in early infancy, however, now many patients were surviving until early adulthood. Andersen published her final paper in 1959 on the reoccurrence of cystic fibrosis in young adults. It was not until the early 1980s, where researchers could determine the actual cause of cystic fibrosis, being - a single mutation causing incomplete synthesis of a transmembrane protein, resulting in thick, clogging secretions mainly in the pancreas and respiratory tract. In addition to her research on cystic fibrosis, Dorothy Hansine Andersen also initially investigated and described a rare glycogen storage disease, glycogen storage disease type IV (GSD IV) also known as Andersen's disease. It is caused by a lack of activity in glycogen-branching enzyme resulting in accumulation of glycogen in the liver. This disease is inherited in an autosomal recessive manner and the first symptoms beginning appearing during a child's first few months of life. This disease is usually fatal within the first few years of life. Towards the end of her career, Andersen had developed lung cancer from smoking and underwent surgery in 1962. Dorothy Hansine Andersen died at the age of sixty-one on March 3, 1963, in New York, New York. After her death in 1963, she was honored with the Distinguished Service Medal at the Columbia Presbyterian Medical Center. In remembrance to her work on cystic fibrosis, Dorothy Hansine Andersen was inducted into the National Women's Hall of Fame in 2002. Dorothy Hansine Andersen was often criticized for her "unladylike" lifestyle and interests including hiking, canoeing, and carpentry; however, she was well-liked as a professor and was defended by the supporters of her talent and contributions to the field of medicine. She had a withdrawn personality and was a heavy smoker. This is what ultimately led to her development of lung cancer and her death in 1963. ^ a b c d e f g Aydelotte, Allison (February 2000). "Andersen, Dorothy Hansine (1901-1963), pediatrician and pathologist". American National Biography Online. Oxford University Press. 1. doi:10.1093/anb/9780198606697.article.1200018. Retrieved 25 November 2018. ^ Machol, Libby (1980). Notable American Women: The Modern Period. United States of America: Radcliffe College. ^ Windsor, Laura (2002). Women in Medicine: An Encyclopedia. Santa Barbara, California: ABC CLIO. p. 7. ISBN 978-1-57607-392-6. Retrieved 1 December 2018. ^ a b c d Clague, Stephanie (March 2014). "Spotlight Historical Profile Dorothy Hansine Andersen". The Lancet Respiratory Medicine. 2: 184–185. ^ a b Oakes, Elizabeth (2007). Encyclopedia of World Scientists (revised ed.). New York: Infobase Publishing. pp. 18–19. ISBN 978-0-8160-6158-7. Retrieved 1 December 2018. ^ a b Abramovitz, Melissa (2013). Cystic Fibrosis. Farmington Hills, Michigan: Lucent Books. p. 13. ISBN 978-1-4205-0901-4. Retrieved 1 December 2018. ^ Andersen, D.H. (1938). "Cyst leiesic fibrosis of the pancreas and its relation to celiac disease". Am J Dis Child. 56 (2): 344–399. doi:10.1001/archpedi.1938.01980140114013. ^ Marsden, Deborah. "Andersen Disease (GSD IV)". NORD (National Organization of Rare Diseases). Retrieved 1 December 2018. ^ Mosby, By (2010). Mosby's Pocket Dictionary of Medicine, Nursing & Health Professions - E-Book (6 ed.). St. Louis, Missouri: Mosby Inc. p. 74. ISBN 978-0-323-05291-7. Retrieved 1 December 2018. ^ Machol, Libby (1993). Notable American Women: The Modern Period : a Biographical Dictionary, Volume 4. Cambridge, Mass [u.a. ]: Belknap Press of Harvard Univ. Press. pp. 18–19. ISBN 9780674627338. ^ "Dr. Dorothy Hansine Andersen". Changing the Face of Medicine. 3 June 2015. ^ "Dorothy Hansine Andersen". Whonamedit? - A dictionary of medical eponyms. Retrieved 1 December 2018. Shearer, Barbara; Shearer, Benjamin (1996). Notable women in the life sciences : a biographical dictionary (1. publ. ed.). Westport, Conn. [u.a. ]: Greenwood Press. ISBN 978-0313293023.